Our world is not just a world but it now has become the ‘Digital World’. To stand out in a competitive market, you really need the right set of tools that will empower your sales reps to be more productive. 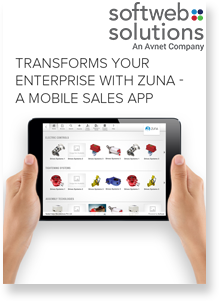 Softweb Solutions brings a revolutionary product- Zuna- to boost your sales. This iPad app is available in the app store and it comes with excellent inventory functionality that allows you to organize your products category or add specific items to a favorites list; add PDF & media files and with advances search functionality. Your business needs synchronized master list of customers, products, prices, orders, locations, and other business critical data. How does Zuna help the Enterprise Users? ZUNA does stand out! Why?